The men who share a camaraderie in the apartment complex have all gathered for their daily round of drinks on the rooftop (after all the days of the regular bars in Kerala is now history) and Ulahanan (Mohanlal) is pissed off because he realized that the chapter of the lady who was enticing him over the last few days is now a closed one. 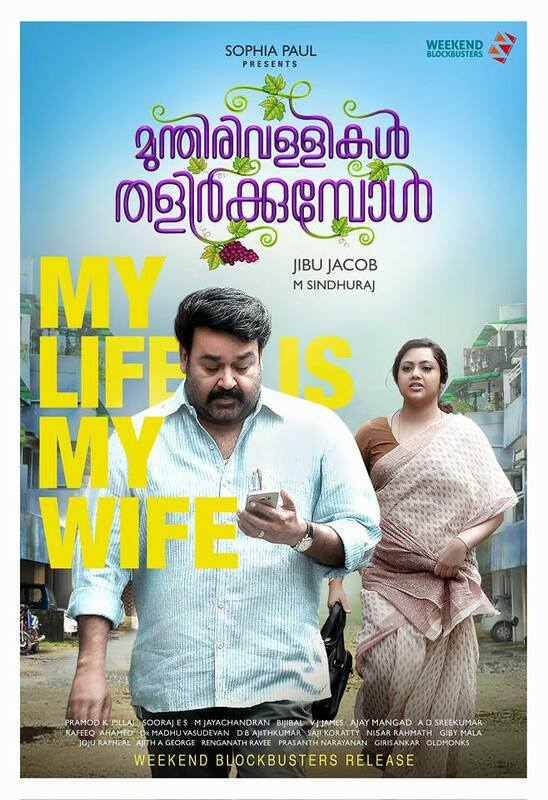 Irritated and angry at the same time, he forces his neighbour and friend Venukuttan (Anoop Menon) to make him speak with one of his numerous girlfriends over phone right then. Though initially unwilling, Venukuttan does go on to dial someone on his mobile phone eventually and gives the phone to Ulahanan without revealing the name of the lady. Ulahanan goes on to speak to the person over the phone, only to realize that he has been tricked by Venukuttan, as the person on the other end is none other than his wife, Annyamma (Meena). This is just one of various wonderful moments from Jibu Jacob’s Munthirivallikal Thalirkkumbol, which has finally hit the theatres after a delay due to the film industry strike in Kerala. Jibu Jacob had started off initially as a cinematographer, working on various films over more than a decade before finally turning director with Vellimoonga (2014) which was a surprise hit, going on to cement Biju Menon’s position as a leading man especially in the comedy genre. Hence when it was announced that Jibu’s second film would feature Mohanlal and that the superstar would be paired with Meena once again, the film automatically gained a lot of traction. We all know that the Mohanlal-Meena combination over the last couple of decades has gone on to become a highly successful pair in Malayalam cinema, with their last outing being the mega blockbuster Drishyam. 2016 was a trailblazing year for Mohanlal, with 2 of the biggest ever blockbusters in the history of the Malayalam film industry going to him, Priyadarshan’s Oppam and Vysakh’s Pulimurugan, both redefining his image as an action hero. Just when one was beginning to wonder if the success of these 2 films would see the veteran actor go back to the larger than life roles with a vengeance, it was a delight to see the promos of Munthirvallikal Thalirkkumbol, as it promised a simple slice of life film, something that Mohanlal has mostly done justice to. Based on V.J.James’ short story Pranayopanishath, Munthirivallikal Thalirkkumbol is a a tale that revolves around Ulahanan, who lives with his wife Annyamma, daughter Jini (Aima Rosmy Sebastian) and son Jerry (Sanoop Santosh). There seems to be a spark missing in the married life of Ulahanan and Annyamma, their lives having fallen into a predictable pattern now. Ulahanan is a Panchayat Secretary who leads a mechanical life, going to office and coming back by the same bus at the same time, having a few drinks in the evenings with his neighbours and then signing off for the day. Annyamma on the other hand is a housewife who keeps herself busy looking after the children, talking to the neighbours and seeking refuge in soaps on T.V. During a college alumni reunion Ulahanan goes on to meet his old sweetheart Indulekha (Asha Sarath), the meeting giving way to Ulahanan’s re-awakening of his romantic side as he realizes that he needs to reignite the spark back in his life. What does Ulahanan go on to do from thereon and what happens to the rest of the family as well is what we go on to see as the tale unfolds further. Since I’m yet to read the short story I am not in a position to comment on how the film compares to it (though I’m told that the short story has many layers which have gone unexplored in the film) but what I can certainly say is that writer M.Sindhuraj and director Jibu Jacob have really managed to impress in their own ways. I say this because the plot of Munthirivallikal Thalirkkumbol as such is something that is extremely wafer thin and to convert that into a 154 minute full-fledged feature film and keep to it engaging all the way is certainly no joke. M.Sindhuraj has woven in a string of wonderful moments in the screenplay and Jibu Jacob has gone on to execute them in wonderful fashion, making the proceedings quite entertaining on screen. Take for example the lovely moment where Ulahanan goes on to reveal everything about Julie (Neha Saxena) to Aamy/Annyamma, followed by Aamy going on to have a hearty laugh and in turn share details of men who are troubling her. Even the follow up scene to this is extremely humorous and leaves one smiling. Around the halfway stage the film does go on to slightly remind you of one of last year’s successful films, Anuraga Karikkin Vellam even as Ulahanan and Aamy rediscover love and set out to make their lives colourful all over again. After a while there is even a lurking fear of the film going the Drishyam way, but thankfully it never ends up taking that route. Even the comparison with Anuraga Karikkin Vellam isn’t something to be worried about; yes there is an element of similarity but thankfully Munthirivallikal Thalirkkumbol has an identity of its own and it is definitely not a pale shadow of the other film. Credit also to editor Sooraj E.S for ensuring that the pacing of the film is not a problem, in fact there’s hardly any dull moment in the film. The songs by Bijibal and M.Jayachandran are pleasant but nothing outstanding though. The film benefits from an extremely memorable casting, the supporting cast contributing equally to making the film work to a large extent. Suraj Venjaramoodu, Sharafudheen , Sohan Seenulal make the Panchayat office portions a breezy watch, but it is the lady who has a crush on Ulahanan who leaves the most impact among them. Alancier Ley Lopez , Kalabhavan Shajon, Srinda Ashab and Bindu Panicker leave a mark as the friendly neighbours of Ulahanan and Aamy, while Asha Sarath is impactful in a cameo. It’s nice to see Anoop Menon playing Venukuttan, a character which seems him display his proficiency with comedy. Sanoop Santosh and Aima Rosmy Sebastian as Jerry and Jini, the children of Ulahanan and Aamy are wonderful; the way they playfully make fun of their parents rekindling their romance is a delight to watch. Meena is charming and makes the transition from a bored housewife Annyamma to the very much in love and cheerful Aamy quite comfortably. Her scenes with Mohanlal are lively and quite a treat to watch. Saying that Mohanlal sinks into the role of Ulahanan would be an understatement, he is a natural in playing the slice of life character, a welcome change after his larger than life avatar in Pulimurugan. Ultimately Munthirivallikal Thalirkkumbol isn’t a great follow up act to Vellimoonga from Jibu Jacob, but it’s a film that offers wholesome entertainment for the family and is a good start for the Malayalam film industry after the unfortunate strike. It is also the better of the 2 new releases and is definitely worth a watch at the cinemas.